One of four new residential models from Johnson Health’s high-end brand featuring natural movement and smooth resistance in a compact machine. Click Here To Save Hundreds on the New E30 from Matrix! Since this is the high end brand of Johnson Fitness, a step above their popular Vision line, all of the Matrix ellipticals feature the most advanced technology, making your workouts that much more efficient. The E30 has an eddy current brake system, which makes transition from one resistance level to the next extremely smooth and Suspension Elliptical technology that provides quiet, consistent motion throughout your workout due to its wheel and track free design. These two features combine to give you the ideal workout, which maximizes your results. One of the unique features found on Matrix treadmills, bikes and ellipticals is the ability to choose from three different consoles to customize your machine. 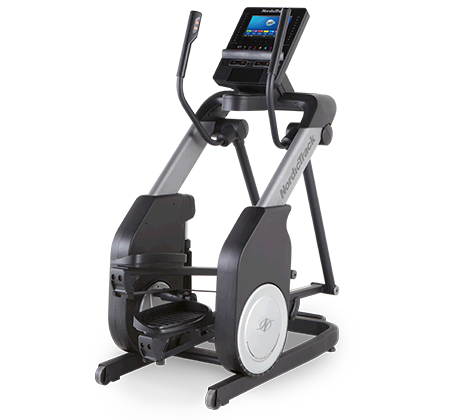 The E30 suspension elliptical has a choice of the XR, an 8.5″ LCD display; the XER, a 10″ touch screen; and the XIR, a 16″ HD touch screen. All of the consoles allow for wireless heart rate monitoring and feature built in workout programs. The XER and XIR are a little more advanced, offering Bluetooth connectivity and app integration as well as a free Polar chest strap for more accurate heart rate readings. All of the Matrix ellipticals are Passport ready, meaning you can sync the trainer to your HD TV and watch footage of real destinations as you run. The resistance level automatically changes to match the terrain and your workout stats appear right on the screen. The XER and XIR consoles take that a step further with Virtual Active, so you can watch the HD footage right on the machine itself if you prefer. There are two destinations built in: the American Southwest and Northern Italy, and you can purchase additional destinations to change it up. This is a very cool immersive experience with ambient sounds to really make you feel like you are working out outdoors. In addition to the built in workouts (5-11 depending on what console you end up choosing) you also get 20 levels of resistance, a nice 20″ stride, Viafit workout tracking, oversized pedals, dual action handles, water bottle holder, accessory tray and a very generous warranty. The Matrix E30 looks and feels like the machines you use in the gym, yet is very compact at only 58″ long when not in use. The company focused on bringing the same durability and ergonomics that their commercial line is known for to the home market, and they have definitely accomplished that. The Suspension Trainers are not light; the E30 weighs in at around 284 lbs. and its big brother the E50, weighs in at almost 300 lbs. So make sure you find the ideal spot in your gym, because you’re not going to move this machine around too much. We tried out a model with the XER console, which features a 10″ touch screen and Bluetooth wireless capability. If you can afford the extra few hundred the touch screen is definitely worth it because in addition to all of the apps you get speakers, a USB port, Virtual Active videos, the free heart rate monitor and 5 or 6 additional workouts. So it really is worth it in my opinion. The Suspension elliptical technology definitely delivers…the feel is very natural throughout the elliptical motion. There is no track or wheels to contend with so it’s kind of like you are working out on air. The E30 is very quiet, and transition from one level to the next seems instantaneous and seamless. One thing that is missing here is incline, a feature that you will only find on the Ascent Trainers, so if incline is important to you you might want to consider the A30 and A50 models. Otherwise all of the Matrix ellipticals are quite similar. The E50, which is the other suspension trainer, features a more advanced resistance system, 30 levels of resistance, multi position handles and a longer parts warranty. Either model is a great choice, and the workout is top-notch. Matrix has successfully transitioned into the residential market from what we have seen thus far. The Matrix E30 Suspension Elliptical is a well-designed trainer with great features, innovative technology and a solid warranty. The ability to choose your own console only adds to its appeal, and it will be interesting to see how it ends up competing head to head with Life Fitness, Precor and the other commercial brands that have forayed into the residential market. If you are looking for a really high-end machine that will last for years, Matrix is a very good choice. Sure, these are not the cheapest machines on the market, but you certainly get what you pay for.